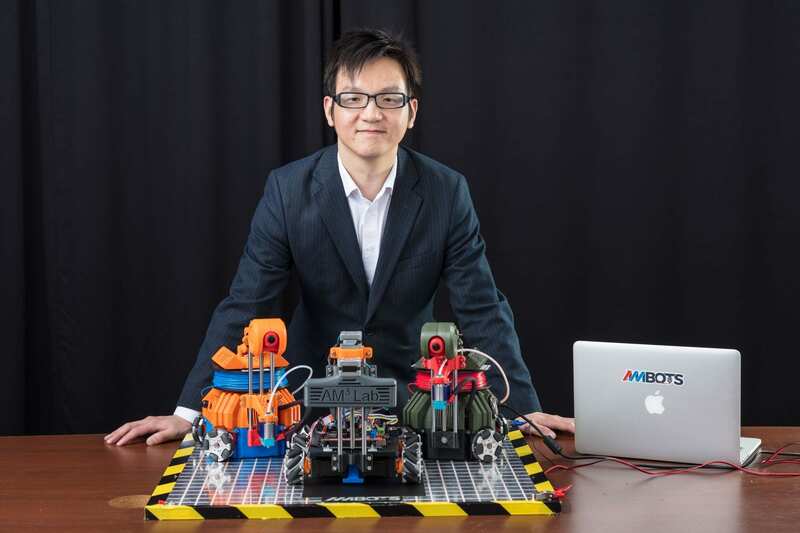 As a company, Ambots was founded in the AM3Lab and System Integration & Design Informatics Laboratory (SiDi Lab) at the University of Arkansas by Wenchao Zhou, Lucas Marques, and Austin Williams. As a product, on the other hand, Ambots stands for Autonomous Mobile roBOTS and Advanced Manufacturing roBOTS. These compact machines incorporate a FDM/FFF 3D printer with an E3D V6 HotEnd, and are 80% percent 3D printed. Four omni wheels enable the Ambots to move across the X and Y axes, with two ADNS-9800 laser motion sensors controlled via a wireless connection. Designed to work collaboratively, Ambots can in theory move around the entire factory to 3D print parts, enabling multicolor and multi-material end products.